When a doctor performs a test for strep throat in her office, she swabs the patient’s throat and sends the sample to a lab. There, a trained technician will run a series of reactions on expensive equipment to obtain a result. These procedures are both time-consuming and costly. Wouldn’t it would be great if the patient could just pick up a simple kit at the drugstore, or have the doctor perform the test at one’s bedside? A micro laboratory device of this kind surely would make life easier for many of us, but in economically disadvantaged areas this kind of technology could save lives. In fact, researchers have been working for more than twenty years to scale down lab procedures for medical testing with the use of a so-called “lab-on-a-chip” – and many already are looking forward to when these tiny labs on microfluidic devices can be used to improve health care for all of us. 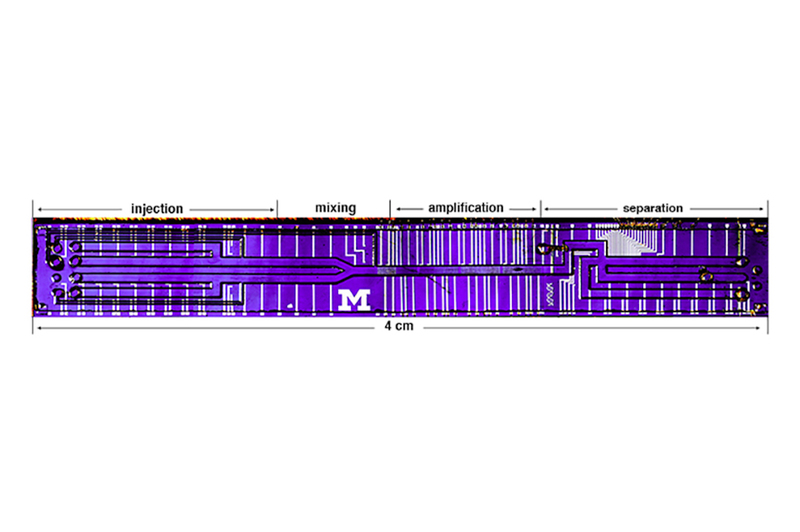 One of the first of these integrated microfluidic chip devices was developed at the University of Michigan by Mark Burns, T.C. 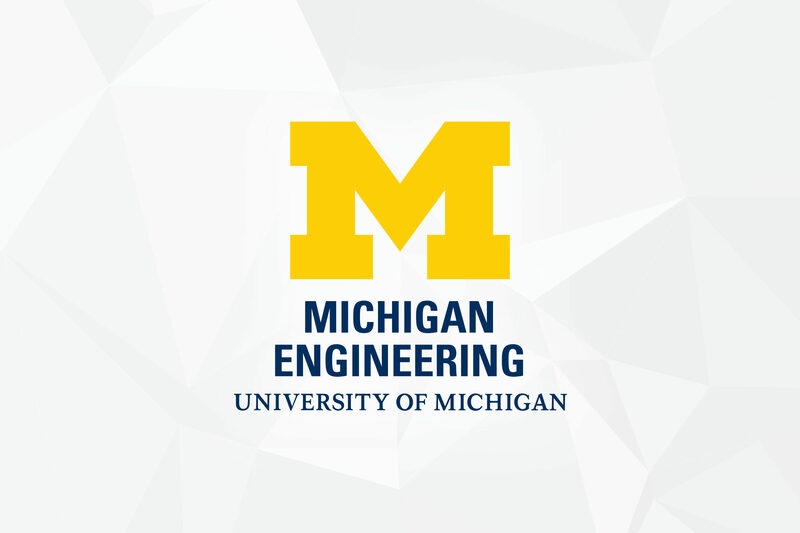 Chang Professor of Engineering, from chemical engineering; David Burke, professor of human genetics; and Carlos Mastrangelo, formerly an electrical and computer engineering professor at Michigan. The chip they reported on in 1998 detected tuberculosis, an infectious disease caused by the bacterium Mycobacterium tuberculosis. But it wasn’t always going to be a diagnostic device – in fact, their initial plan was to streamline the sequencing of the human genome. In 1992, Mark Burns, then assistant professor of chemical engineering, was invited by Charles Cain, then chair of biomedical engineering, to attend a meeting in the Medical School with a group of researchers who had a grant to work on sequencing human DNA, or to determine the DNA code of base pairs, the unit of information in a human’s genetic code. Also in attendance that day: Francis Collins, then professor of internal medicine and human genetics at Michigan (and now, the Director of the National Institutes of Health); Ken Wise, professor of electrical engineering and a pioneer in microelectromechanical systems (MEMS); and David Burke, an assistant professor from human genetics. A micro laboratory device of this kind surely would make life easier for many of us, but in economically disadvantaged areas this kind of technology could save lives. Burke was charged with finding new technologies to assist in the sequencing of DNA for this grant. He explained to the group that the current technique for one step, called gel electrophoresis, was to tag the DNA with fluorescent molecules, put it on long gels, then put an electric field along the gels that tugged on the electrically charged DNA. The DNA would separate into bands as the shorter strands travelled along the gel more quickly than the longer ones. Then he had the laborious task of observing the fluorescent bands and writing down the sizes of the DNA fragments. At that time it cost $20 in reagents to generate one reaction in a 50-microliter droplet of fluid. Add to that the cost of labor to run the test and record results. Burke knew there had to be a quicker and cheaper way. IMAGE: Measuring about 4 cm long and 0.5 cm wide, the device is the size of a large paperclip and as thin as a dime. During operation, a solution containing DNA and another containing special reagents to be mixed with the DNA are injected into small holes on the left end. Drops that are approximately 1/1000th of a milliliter in volume are separated out and moved by air pressure, flowing to the right down channels—flat tubes or pipes that are thinner than a sheet of copy paper, about 0.050 mm tall. As the drops move along, their individual channels merge into one, mixing the DNA with the reagents. The combined drop continues moving to the right, pausing over a heated section where the temperature is controlled to allow a special reaction to take place. When the reaction is complete, the drop moves farther to the right, where a special dye is added to mark the DNA, and then the products of the reaction are separated by size and are electronically detected. “I knew if we could use a 10- or 100-fold smaller volume by putting the system in channels on a piece of glass and control everything with a computer, it probably would save time and money,” Burke says. No human hands would touch the tiny liquid drops. Burke’s initial idea was to put the DNA solutions on an etched piece of glass, cover the plate with flexible plastic and run a roller over it to get the droplets to move around and separate. Although Burns recalls being a little shy about speaking up as the most junior member of the group, he suggested that this process might be conducted using a chip to move packets of fluids just as electrical engineers move packets of electrons. He knew that the electronics existed and that researchers in the field of capillary electrophoresis had been successful at etching and bonding glass to move fluids through tiny channels. Although the researchers in the meeting thought it would be challenging to create such a device, they liked his idea and thought it might be a solution. During the months that followed, Burns and Burke decided they were interested in pursuing this chip for genome analysis. They knew that after the human genome and other genomes were successfully sequenced (the NIH’s Human Genome Project was gaining steam around this time with the recent appointment of Michigan’s Francis Collins as director), the world would need devices to view specific cells, to identify genetic differences among cells and to diagnose diseases and extract other information from DNA. They also knew that would require searching for a variation in a single base pair, or a single mismatched nucleotide. Targeting particular DNA sequences, as opposed to recording the full genome, essentially shrunk the haystack they had to look through. The pair brought in Carlos Mastrangelo to help with the microfabrication or micromachining. Burke had about $60,000 available to spend on this pursuit, so they were able to purchase some equipment and provide money to support graduate students Tim Sammarco (from the Burns group) and Francis Man (from the Mastrangelo group) and Brian Johnson, an engineer from Burke’s lab. Work began to design a diagnostic device for infectious diseases. One year later, in 1993, the team applied for and received a grant from the NIH for $1.3 million dollars –launching efforts that would eventually lead to a new field of study called microfluidics, which enables scientists to move liquid through channels and to perform reactions and separations within fluid packets. IMAGE: Close-up of the integrated device separation stage. The DNA has a fluorescent dye attached to it, and then it is pulled to the right down the top channel by an electric field into a sponge-like maze of holes. Shorter DNA strands are able to move through this maze more quickly, resulting in the pattern observed in the third image, where groups or "bands" of shorter strands have moved far to the right, while groups of longer pieces have moved shorter distances. This sample of DNA contains only strands that are multiples of 50 base pairs in length. There are more strands of the 350 and 800 base pair lengths so that those bands will appear brighter. In 1996, Burns and Johnson were able to begin work with Becton Dickinson, a medical technology company that manufactures and sells medical devices and instrument systems, to learn more about the chemistry necessary to design the reaction system. Becton Dickinson already had developed a reaction system for analyzing DNA in connection with diagnosing tuberculosis, so Burns and his colleagues set out to create a device for it. Burn’s students were assigned to design different sections of the chip. Madhavi Krishnan was responsible for making the reaction system properly amplify the 690-base-pair target within the 4.4 million base pairs of the tuberculosis genome. Kaylan Handique developed the hydrophobic patching, using a substance similar to wax, to stop and redirect fluidics so they moved through the chip as desired. Sundaresh Brahmasandra worked on the component that would separate the pieces of DNA once they were amplified, and Vijay Namasivay worked with Jim Webster, from Mastrangelo’s lab, to develop a fluorescent detector that would find and expose the green DNA bands so results could be read. During operation, a solution containing DNA and another containing special reagents to be mixed with the DNA are injected into small holes on the left end. Drops that are approximately 1/1000th of a milliliter in volume are separated out and moved by air pressure, flowing to the right down channels—flat tubes or pipes that are thinner than a sheet of copy paper, about 0.050 mm tall. As the drops move along, their individual channels merge into one, mixing the DNA with the reagents. The combined drop continues moving to the right, pausing over a heated section where the temperature is controlled to allow a special reaction to take place. When the reaction is complete, the drop moves farther to the right, where a special dye is added to mark the DNA, and then the products of the reaction are separated by size and are electronically detected. 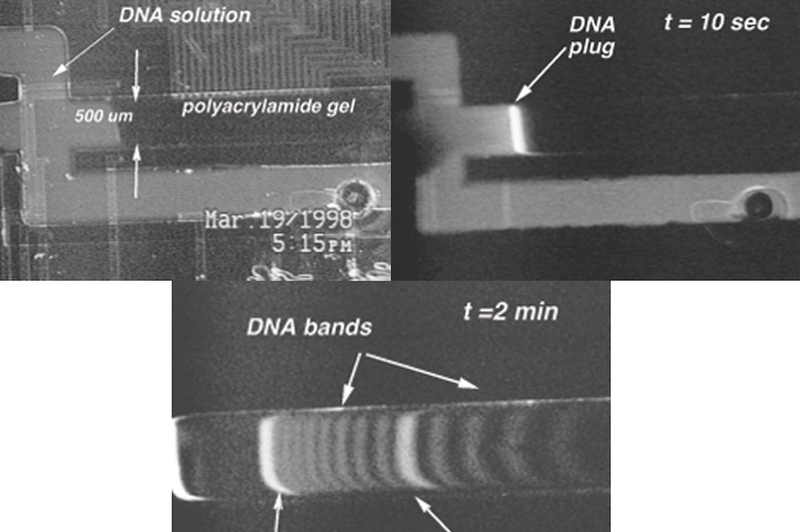 By 1998, the group had developed their microfluidic device – the first miniaturized DNA analysis system that became known as a “lab-on-a-chip.” The device included a micromachined channel for transporting the chemicals that drive reactions (called reagents) on the chip, a reaction chamber, an electrophoresis-based separation system and fluorescent detectors. 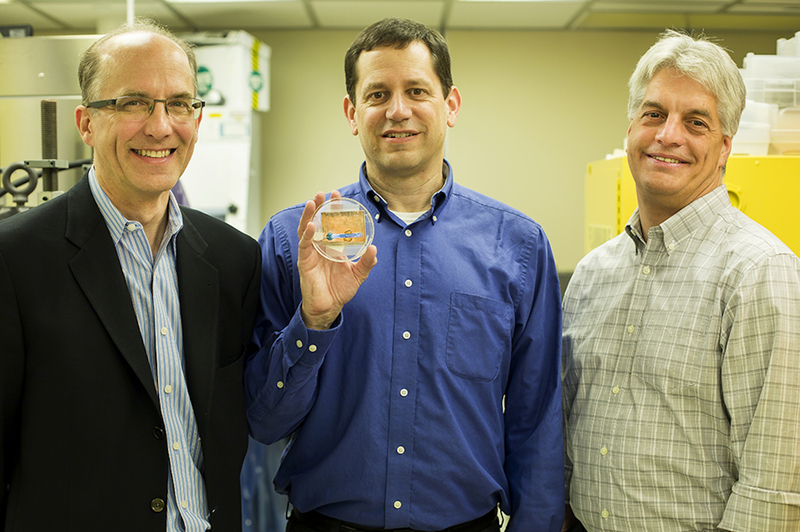 IMAGE: Mark Burns, T C Chang Professor of Engineering and Department Chair of Chemical Engineering; Brian Johnson, Senior Research Engineer of Chemical Engineering; and David Burke, Interim Chair of Department of Human Genetics and Professor of Human Genetics, pose with a microfluidic device. 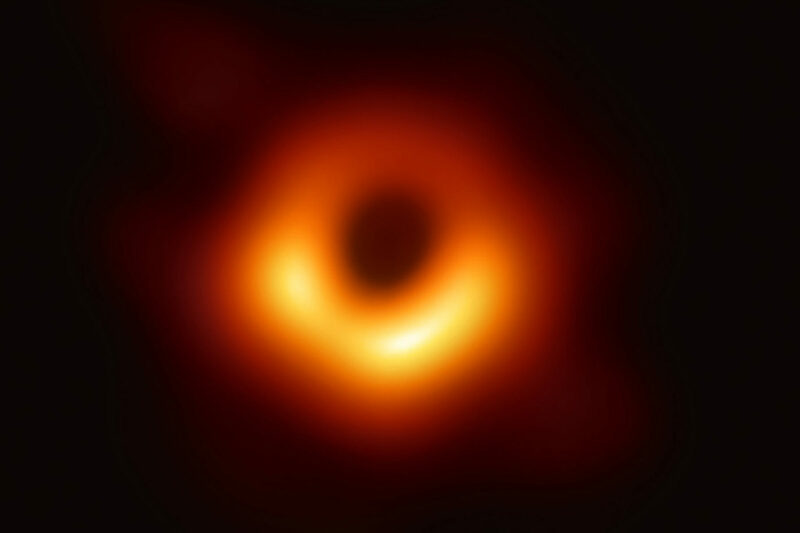 Photo by Joseph Xu, Michigan Engineering. As pioneers in the creation of these devices, the team was the first to develop an integrated system for DNA analysis that enables users to add a sample, such as saliva or blood, with a reagent to create a reaction that will perform a separation and a detection all on one chip. The paper about their invention has been cited in more than 1600 articles since its publication in Science in 1998 (M. A. Burns, B. N. Johnson, S. N. Brahmasandra, K. Handique, J. R. Webster, M. Krishnan, et al., “An integrated nanoliter DNA analysis device,” Science, vol. 282, pp. 484-487, 1998). Eight of Burns’ patents are licensed exclusively to Becton Dickinson, and these patents form the basis for the company’s BD MaxTM lab-on-a-chip diagnostics platform that is being used for diagnosis of infectious diseases (i.e., MRSA, Cdiff, VRE and GBS). Becton Dickinson is already selling lab kits based on the work performed at Michigan. Two of Burns’ students – Kalyan Handique and Sundaresh Bramasandra – launched a startup company called HandyLab based on the technology they helped to develop as students to make new diagnostic testing products. After nine years in business, this successful endeavor was sold to Becton Dickinson in 2009 for $275 million. 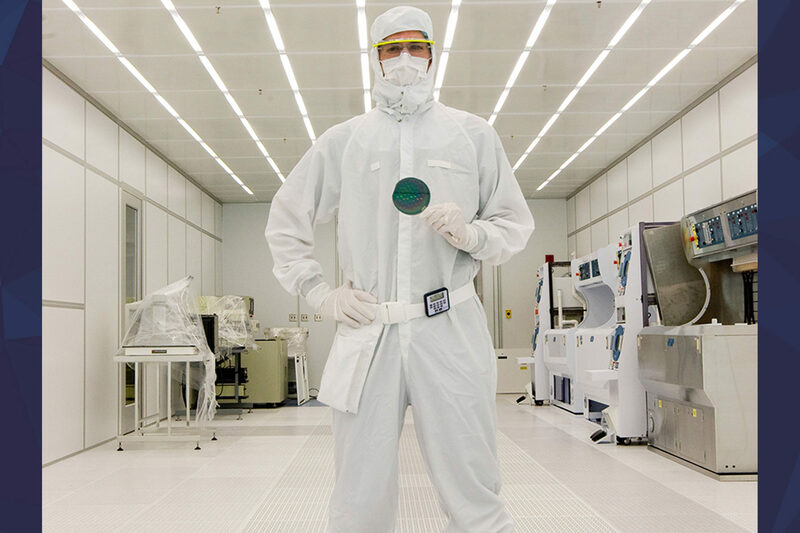 The 1998 chip was referenced in Science’s “Top-Ten” list of scientific discoveries for that year and is among the major research advances in the University of Michigan’s 200-year history. The actual microfluidic device is part of the permanent collection at the National Science Museum in London, England. This project completely altered Burns’ research plans and sent him in an entirely different direction. This project completely altered Burns’ research plans and sent him in an entirely different direction. 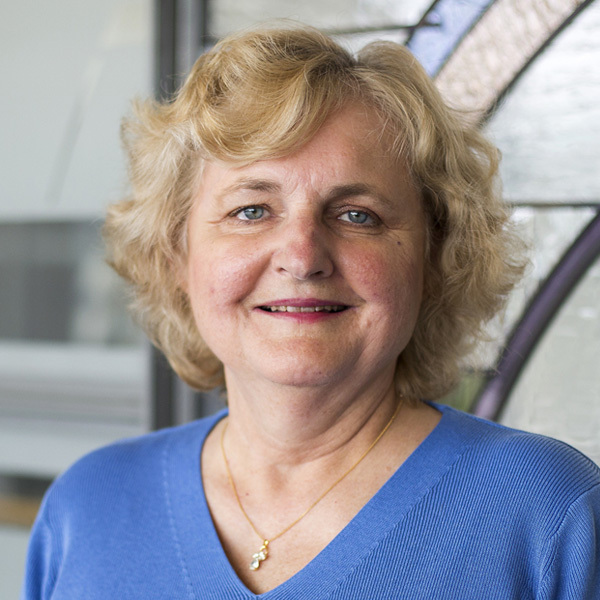 Before beginning the initial chip, Burns was working on protein separations and fermentation broth processing and had never worked with microfabrication, DNA or electrophoresis. 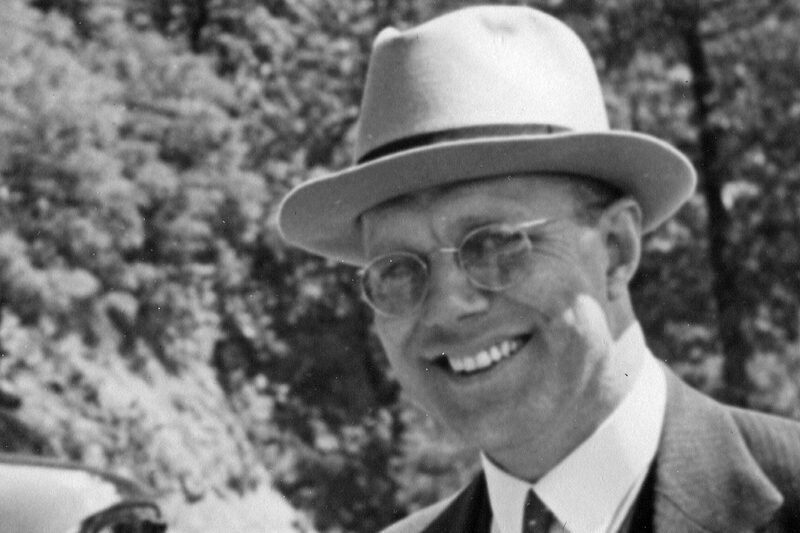 But he became interested in these other projects and soon was designing chips to help asthmatic and cystic fibrosis patients, to diagnose both bacterial and viral upper respiratory infections, to examine both the physical and chemical properties of blood and to grow cells to help differentiate symbiotic from competitive. Burns also collaborated with fellow chemical engineering professors Ron Larson and Mike Solomon to create an influenza diagnostic device, and he later worked with Solomon and Sharon Glotzer, another chemical engineering professor, to construct a device to fuse spheres together to create asymmetric particles. Burns says he looks at the basic device as his personal tiny lab where he can diagnose many diseases and study properties of biological fluids, just as he would in a conventional laboratory. Burns’ experiences with creative approaches to new research – including finding funds to obtain the kinds of preliminary results necessary to submit a successful NIH proposal – were vital in the creation of MCubed at Michigan, a program that employs a similar funding model for University researchers who have novel, interdisciplinary ideas. 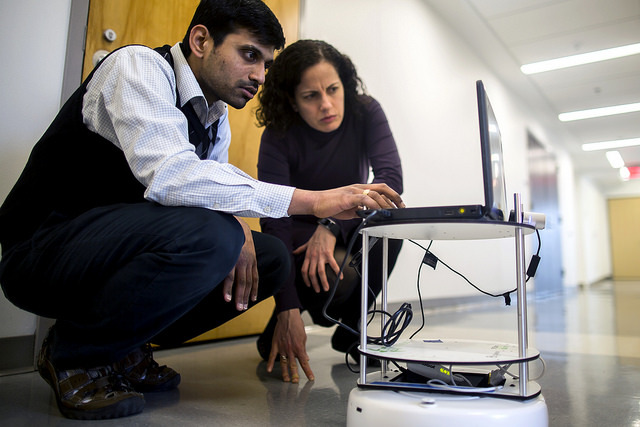 MCubed funds teams of at least three researchers who are faculty members representing at least three different schools or colleges to perform that preliminary work. 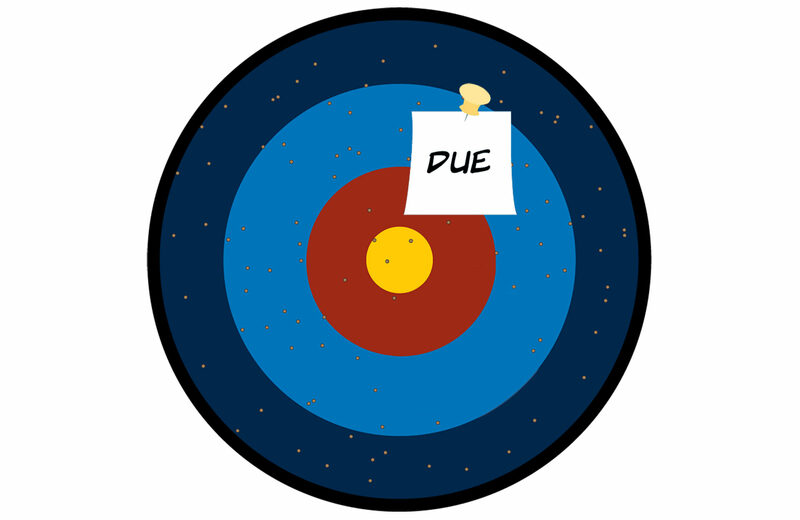 Once those early results have come in, teams often have been able to apply for larger sums from agencies outside the University.